In my post of January 29, 2009 I had mentioned that besides St. Peter's Basilica in Vatican city, three churches, two in Africa and one in South Korea, are claimed to be largest. Subsequently I made posts about Basilica of Our Lady of Peace, Yamoussoukro, Côte d'Ivoire and Winners' Chapel (Faith-Tabernacle), Nigeria. Today I am covering the third church which also claims to be the largest. 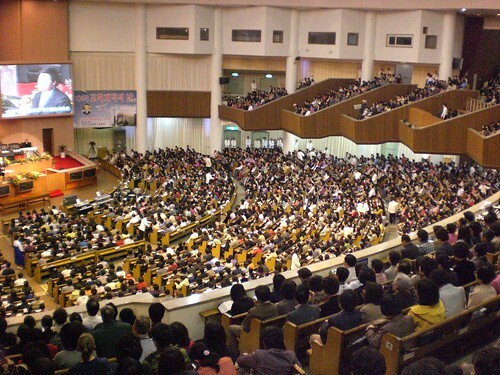 Yoido Full Gospel Church, Yeouido Island, Seoul, South Korea is reportedly the largest non-catholic church in terms of congregation capacity of the building which is large enough to seat 26,000 people. The overflowing worshippers are accommodated in nearby complex and attend the service of the main church through tele-screens. The Yoido Full Gospel Church was founded in May 1958 by David Yonggi Cho and his mother-in-law, pastors of 'Assemblies of God'. Gradually the membership increased and as of 2007, the membership stood at 830,000. The inaugural worship service of this huge Church building at Yeouido Island, Seoul, South Korea was held on On September 23, 1973.